სს „საქართველოს რკინიგზის“ შვილობილმა კომპანია „GR ლოგისტიკა და ტერმინალებმა „ ურთიერთთანამშრომლობის მემორანდუმი გააფორმა ჩინეთის რკინიგზის შვილობილ საერთაშორისო სატრანსპორტო მულტიმოდალურ კომპანიასთან “CRIMT”-თან და კომპანია Lianyungang New Silk Road International Container Development-თან. 28 ნოემბერს თბილისის აბრეშუმის გზის ფორუმის ფარგლებში ,სს „საქართველოს რკინიგზის“ შვილობილმა კომპანია „GR ლოგისტიკა და ტერმინალებმა“ ურთიერთთანამშრომლობის მემორანდუმი გაფორმა ჩინეთის რკინიგზის შვილობილ საერთაშორისო სატრანსპორტო მულტიმოდალურ კომპანიასთან “CRIMT”-თან და კომპანია Lianyungang New Silk Road International Container Development-თან. მოგახსენებთ, რომ ლიანიუნგანი ეს არის პორტი,საიდანაც ხდება საქართველოს გავლით კონტეინერების გაგზავნა. კომპანია“ GR ლოგისტიკა და ტერმინალები„ -ს დირექტორმა ლევან სულაბერიძემ მემორანდუმს ხელი მოაწერა კომპანია „CRIMT”- ის გენერალურ მენეჯერთან ლი ჩონგუისთან და კომპანია Lianyungang New Silk Road International Container Development-ის გენერალური მენეჯერის მოადგილესთან ცჰიუ ბინთან. 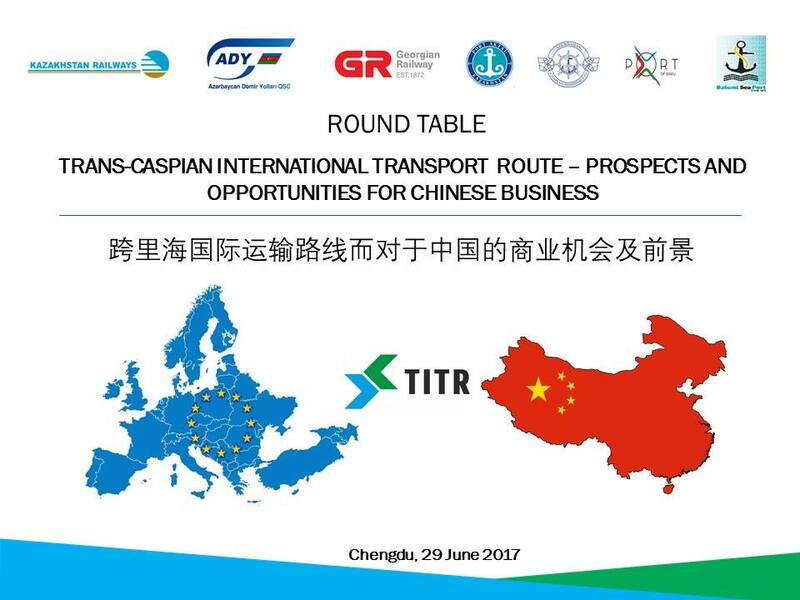 In China, in the city of Chengdu, with assistance of the international association "Trans-Caspian International Transport Route" the forum and a round table have been held. 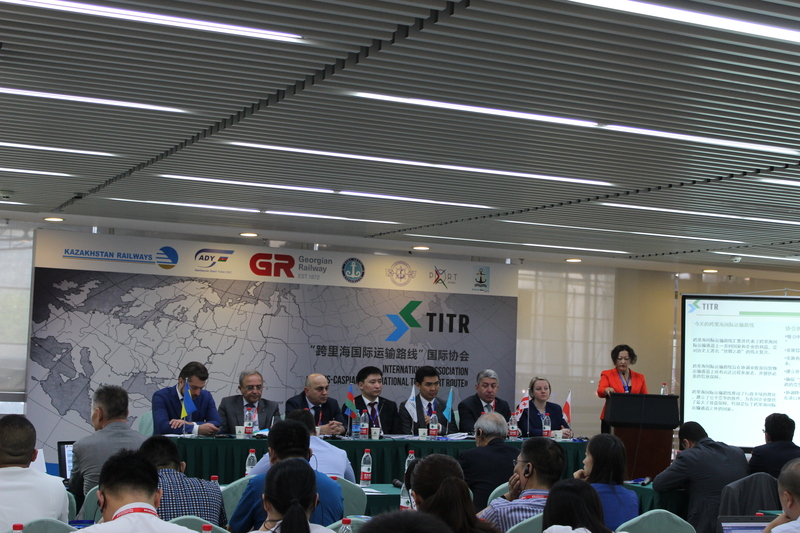 The round table on the subject "The Trans-Ccaspian International Transport Route — Prospects and Opportunities", has been carried out within the Chinese International transport - logistic exhibition CITLE and International logistic global forum. At the forum opening ceremony "Trans-Caspian International Transport Route" and at the international transport - logistic exhibition, as the guest of honor has been invited the delegation of the Georgian railway, which was headed by the Director General Mamuka Bakhtadze. 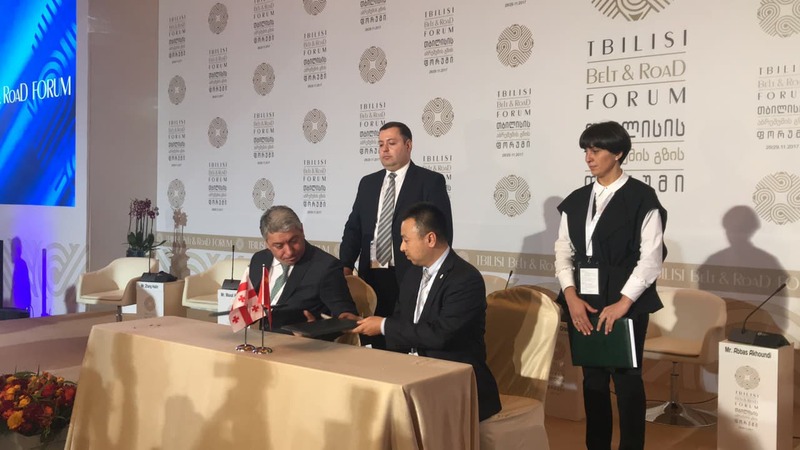 The head of the Georgian railway has held meetings with the mayor and the vice-mayor of the city Chengdu, at meetings he has talked about the capacity of the Georgian railway and its role in the Trans - Caspian route. Mamuka Bakhtadze has also met with Chen Zhong Wei , with Director of port and logistic office of Chengdu Municipality and has talked concerning the opportunities of the Georgian railway. Cheng Zhong Wei has expressed a great interest to the route and has emphasized the big importance of the Trans-Caspian corridor. 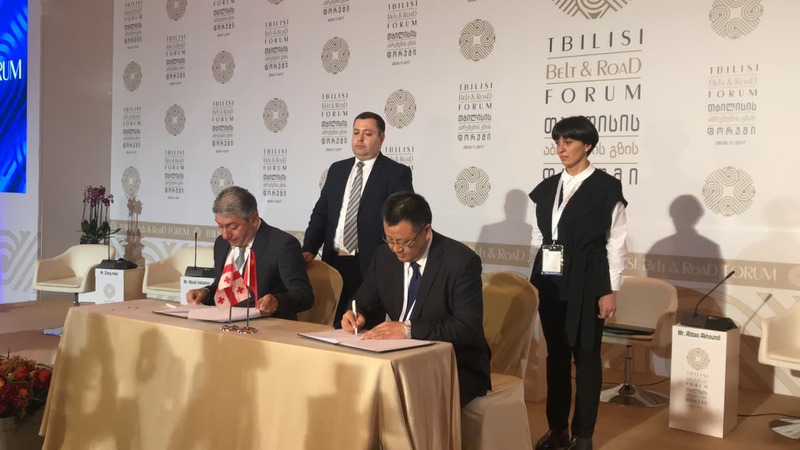 It should be noted, that at meetings with the participants of a business forum Mamuka Bakhtadze has talked about the influences of the development of a tendency of Transcontinental routes in the World, European and Asian Markets and about the growth of efficiency of multimodal transportations. On his explanation, interstate cooperation plays a huge role in the development of the international transport corridor. Also, for the development of the regional transport - logistic infrastructure the introduction of innovative solutions is very important. 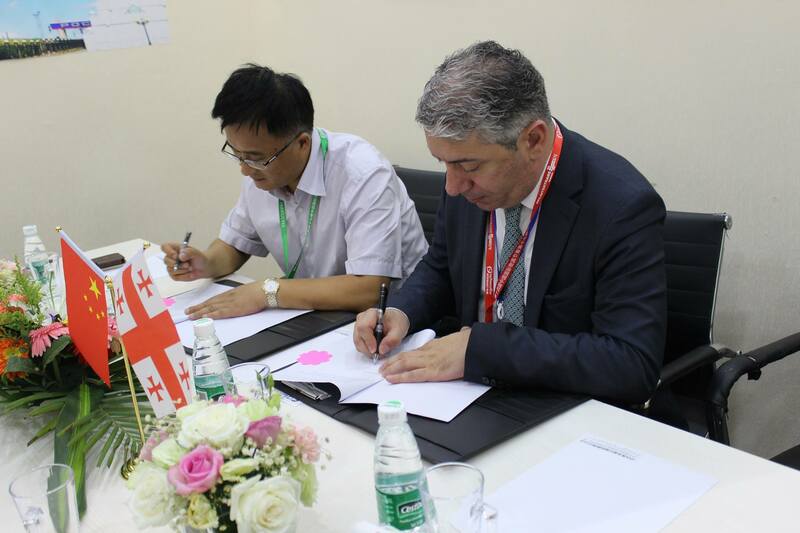 Within the Chinese international transport - logistic exhibition CITLE also has been held the round table, in which together with the railway companies of Azerbaijan, Kazakhstan, Ukraine and Poland, took part Levan Sulaberidze-Director of subsidiary of the Georgian railway “GR Logistics & Terminals”. The purpose of a round table for businessmen - the acquaintance with the opportunities of the mentioned route and assistance to business relations and sustainable development of the countries existing on a route of a new silk road. 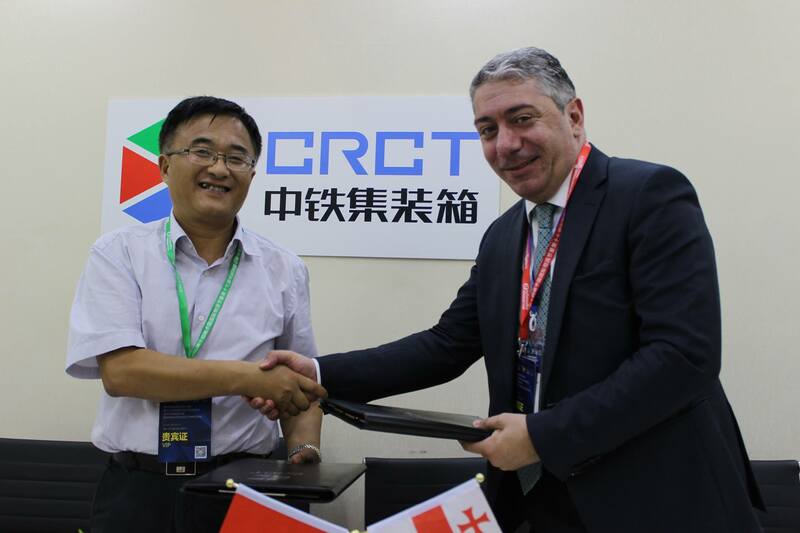 Between "GR Logistics & Terminals" and the Chinese Company CRCT (China Railway container transport) the Memorandum has been made out. The fact that CRCT is subsidiary of China railway is remarkable. 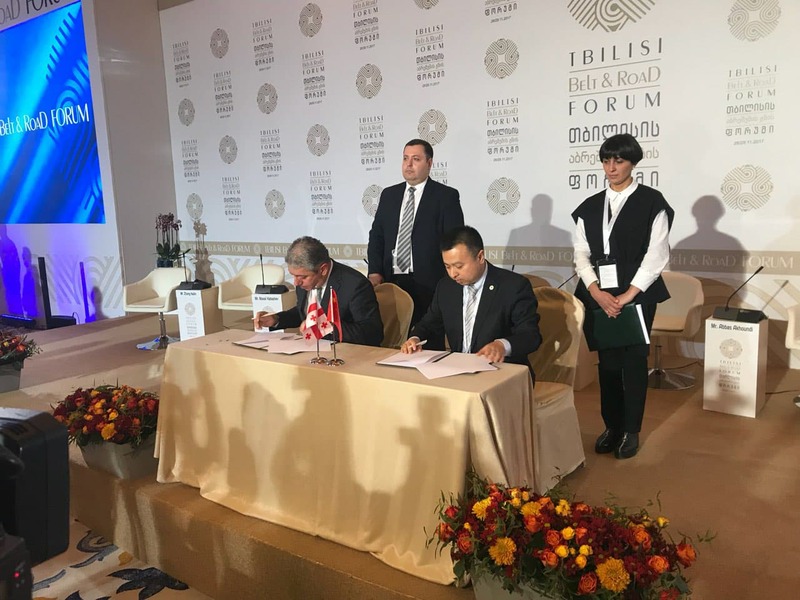 The purpose of the Memorandum is deepening of the relationship between these two companies and creation of the joint working groups which will work on development of a corridor and exchange of information. It should be noted, that meetings with the members of the delegation of Georgia have attracted great interest from representatives of business circles of China. Each of them has expressed desire to visit Georgia and get acquainted with the capacity of the Georgian railway on site. The main goal of the International Association "Trans- Caspian International Transport Route" is the attraction of transit freight to the mentioned route, also, the increase in competitiveness on alternative routes, the development on a route of the integrated logistic product and carrying out effective tariff policy. The association carries out coordination by ensuring information support of the participants of transportation process in direction Asia – Europe and back. ბათუმში „არგუს კასპიის-შავი ზღვის სატრანსპორტო დერეფანი-2016“ გაიხსნაბათუმში, 15-16 სექტემბერს, საერთაშორისო კონფერენცია „არგუს კასპიის - შავი ზღვის სატრანსპორტო დერეფანი - 2016 “ჩატარდა. მე - 3 საერთაშორისო კონფერენციაზე 20 ქვეყნის 200 - მდე დელეგატმა მიიღო მონაწილეობა. "არგუს კასპიის -შავი ზღვის სატრანსპორტო დერეფანი - 2016“ - ზემოხსენებით წარსდგა შპს " ტრანს კავკასუს ტერმინალსის" დირექტორი ლევან სულაბერიძე. დღეს ს/ს ,,საქართველოს რკინიგზის“ შვილობილმა კომპანიამ ,,ტრანს კავკასუს ტერმინალსმა“ და LAM კომპანიათა ჯგუფმა განზრახვათა შესახებ მემორანდუმს ხელი მოაწერეს. მემორანდუმის თანახმად, კომპანიები სატრანსპორტო სფეროში თანამშრომლობით, ხელს შეუწყობენ საქართველოს სატრანსპორტო პოტენციალის მსოფლიო სავაჭრო გზებთან დაკავშირებას. ასევე, ერთობლივად შეიმუშავებენ საზღვაო კავშირს საქართველოს, თურქეთსა და შესაბამის ევროპულ ბაზრებთან. ,,ჩვენ ვამაყობთ იმით, რომ ტრანს კავკასუს ტერმინალსი ტრანს კასპიური კონსორციუმის წევრი გახდა. კონსორციუმი ჩინეთიდან საქართველოში საკონტეინერო გადაზიდვებს უზრუნველყოფს, შემდგომში მათი სხვადასხვა მიმართულებით ტრანსპორტირების მიზნით. ჩვენი კომპანიის გარდა კონსორციუმის წევრები არიან ჩინური, აზერბაიჯანული და ყაზახური კომპანიები. იმედი გვაქვს, რომ LAM ჯგუფი იქნება ერთერთი კომპანია, რომლის მხარდაჭერითაც ჩვენ შავ ზღვაზე თურქეთისა და სხვა მიმართულებით საზღვაო მომსახურებას მივიღებთ, რომ შემდგომში სრულყოფილად უზრუნველყოთ ჩინეთიდან წამოსული ტვირთის მსოფლიოს ნებისმიერ წერტილში ტრანსპორტირება,“ - განაცხადა ,,ტრანს კავკასუს ტერმინალსის,, დირექტორმა ლევან სულაბერიძემ. ,,ბოლო წლების განმავლობაში საქართველო სატრანსპორტო სფეროში მნიშვნელოვნად განვითრდა. ჩინეთი - საქართველოს აბრეშუმის გზა კი, ამ მიმართულებით დამატებით შესაძლებლობებს აჩენს. LAM კომპანიათა ჯგუფი, როგორც გლობალური სატრანსპორტო კომპანია, ტრანს კავკასუს ტერმინალსთან პარტნიორობით ამ შესაძლებლობების მაქსიამლურად გამოყენებას გეგმავს, რაც საქართველოს საშუალებას მისცემს უფრო დიდი როლი ითამაშოს მსოფლიოს ტრნასპორტირების სფეროში. ჩვენ ვამაყობთ იმით, რომ ამ პროექტში ჩვენი წვლილი შეგვაქვს,“ - განაცხადა LAM კომპანიათა ჯგუფის დირექტორთა საბჭოს აღმასრულებელმა სელიმ მაკზუმემ. შეგახსენებთ, რომ ,,ტრანს კავკასუს ტერმინალსის,, 100 % წილის მფლობელია ს/ს საქართველოს რკინიგზა. რკინიგზის შვილობილი კომპანია 2009 წელს დაარსდა და მართავს და ავითარებს საკონტეინერო ტერმინალებს თბილისსა და ფოთში. ხოლო, LAM კომპანიათა ჯგუფი 70 წლიანი გამოცდილების კომპანიაა, რომელიც თავისი საერთაშორისო ქსელების მეშვეობით საზღვაო და ლოგისტიკურ მომსახურებას აერთიანებს. 2015 წლის 16 ნოემბრიდან შპს „ტრანს კავკასუს ტერმინალის“ სატარიფო პოლიტიკაში იგეგმება ცვლილებები.